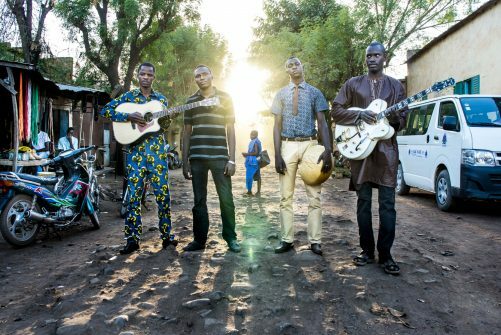 On La Resistance, Songhoy Blues don’t lecture the audience about Africa. They paint a picture of their part of the world with humour and defiance, using special guests to make their points for them, where appropriate. On Sahara, Iggy Pop appears, drawling Songhoy Blues’ message about the difference between the world’s idea of sub-Saharan Africa and the reality: “It’s got a bad reputation / In the developed nations … It’s got a genuine culture / No Kentucky Fried Chicken.” As Aliou puts it: “The track we made with Iggy Pop is talking about the beauty of the Sahara, to bring people in the Sahara to life: Africa is a beautiful continent to discover, so we needed someone legendary to talk about that, so people would really hear. Iggy is not alone: on Mali Nord, the UK rapper Elf Kid offers a call to arms: “Rise up, ’cos Africa’s waiting!” The Liverpool trio Stealing Sheep also pop up on La Resistance. One key thing that has changed since Songhoy Blues made their debut album, Music in Exile, is the state of Mali itself. While it is far from a peaceful place – in January, 80 people were killed when an explosives-laden vehicle was driven into a military camp near the town of Gao; also that month the Festival Au Désert in Timbuktu had to be cancelled for fear of an attack by Al Qaida – the situation is markedly different to the one when the three Tourés were forced into exile. In late April, the government in Bamako was able to install interim authorities in Timbuktu and Menaka in the north of the country, ending a standoff with Tuareg separatists that had prevented the transfer of power back to the government. But some things do not change in the world of Songhoy Blues. Because whether Mali is in the grip of strife, or pulling itself back together, the essential message of the music made by the group remains the same, one of communicating the joy of music. Résistance shares that happiness and that love. And, along the way, it offers so much more.